Snow from my window. Second year in a row with snow in Paris. And from the weather forecast, it looks like it's here to stay! I might have to consider buying proper boots. OMG -- Love Paris in the snow. Th year I lived there (ages ago) it snowed a lot -- and it was wonderful (if somewhat annoying on the practical side). what is the building across the street behind the wall? 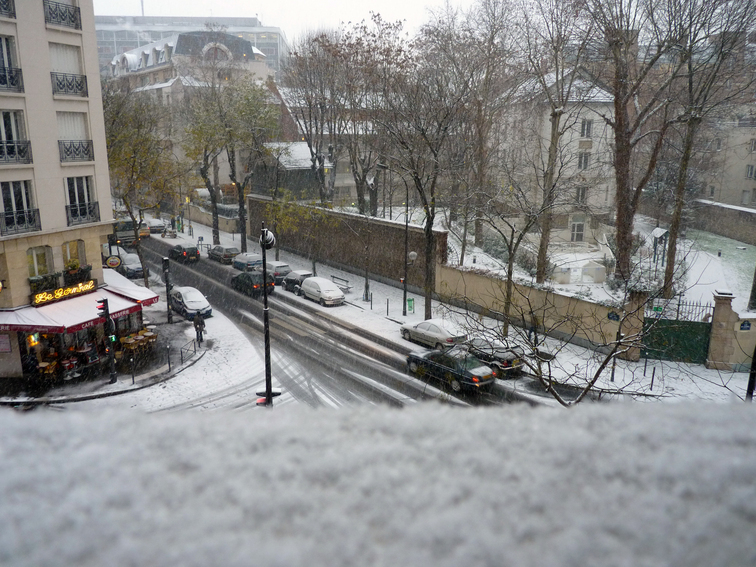 Ohh, Paris in snow seems to be very pretty! I use to think of Paris like in spring, but well, clichés. @striatic it's a hospice. Terminally sick people only. been to paris twice, but never in the snow. This seems something quite special. well, at least they have a nice place. @clickykbd used to be quite unusual! But two years in a row, makes me wonder about this global warming we are hearing about. Beautiful picture, Claude, even if it represents a cold, snowy day. it looks lovely and that cafe across the street looks good too, very inviting. @mfdudu, I could have done without snow too! Hi Claude - thought I would log in and see what you were up to: Nice photo of the snow from your window. Hi, Elly, nice to see you here! The photo has been viewed 1616 times.